India has a special place in the heart of the renowned Slovak writer Jozef Banas. He is greatly inspired by Indian culture and civilization and every day he practices yoga to connect with India. Jozef has come to Jaipur to support the launch of the Hindi edition of his book Code 1, translated by Dr. Amrit Mehta (From Jerusalem to Kashmir in Hindi). 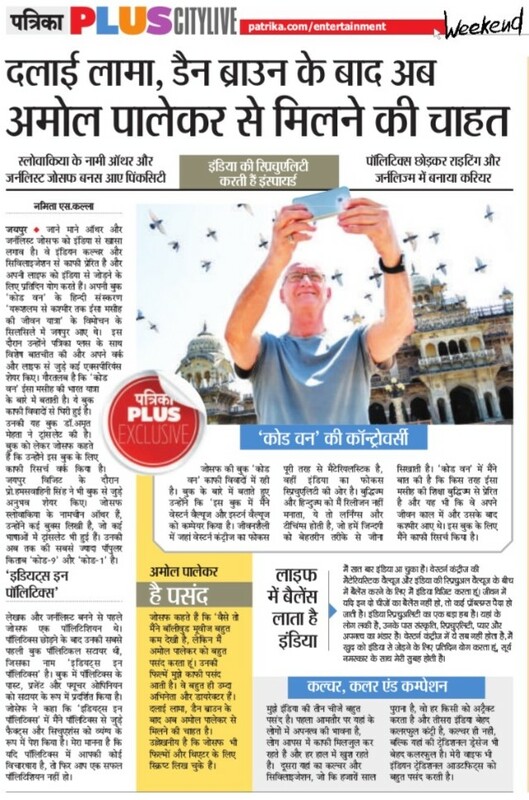 During his tour in India, he was interviewed by the newspaper Patrika plus. Jozef has shared with us many of his life experiences. It is noteworthy that his book describes Jesus’ sojourn to India. The book has raised many controversies. Jozef says that he has done intense research before writing this book. Prof. Hamsavahini also has shared many ideas about the book. Jozef Banas is a very famous author in Slovakia, he has written many books, which have been translated into several languages. Code 1 and Code 9 have been his most popular books till now. Before becoming a writer and journalist, Jozef was active in politics. His first book Idiots in Politics is a political satire. The book depicts the past, present and future opinions of politicians in a satirical manner. Jozef said that even though he has seen very few Indian movies, he likes Amol Palekar and his films a lot. He is an excellent actor and director. After Dan Brown he wants to meet Amol Palekar now. Jozef´s book is surrounded by many controversies. Musing about the book he says that in it he has compared Western and Eastern values. While the Western way of life focuses entirely on materialism, the Indian way of life focuses on spirituality. “I do not see Buddhism and Hinduism as religions; these faiths teach us to live a better life. In Code 1, I have described as to how Jesus’ teachings are inspired by Buddhism, and also that he came to India in his life time. I have done intense research for this book. I love India for three things. The first is the feeling of compassion in the people of this country, its ancient culture attracts everybody, and third that India is a very colourful country.